PARIS, Ark. – Cattle genetics will be at the top of the River Valley Beef Cattle Conference agenda, to be held Feb. 13 at the Hughes Center in Russellville. 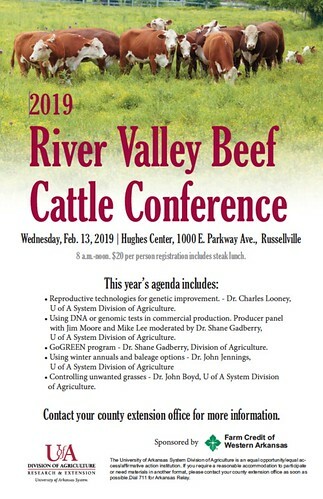 CATTLE CONFERENCE -- The 2019 River Valley Beef Cattle Conference is scheduled for Feb. 13. Conference registration is $20 per person and the Hughes Center is located at 1000 E. Parkway Avenue, Russellville. For more information about the conference, contact your county extension office. The conference is sponsored by Farm Credit of Western Arkansas.